After a couple of pretty hectic and overwhelming weeks, I was able to spend a few quiet moments in my kitchen today calmly baking and sipping tea while listening to music that did not involve Disney or Raffi. I had forgotten how therapeutic it can be to cook for no other reason than "just because". 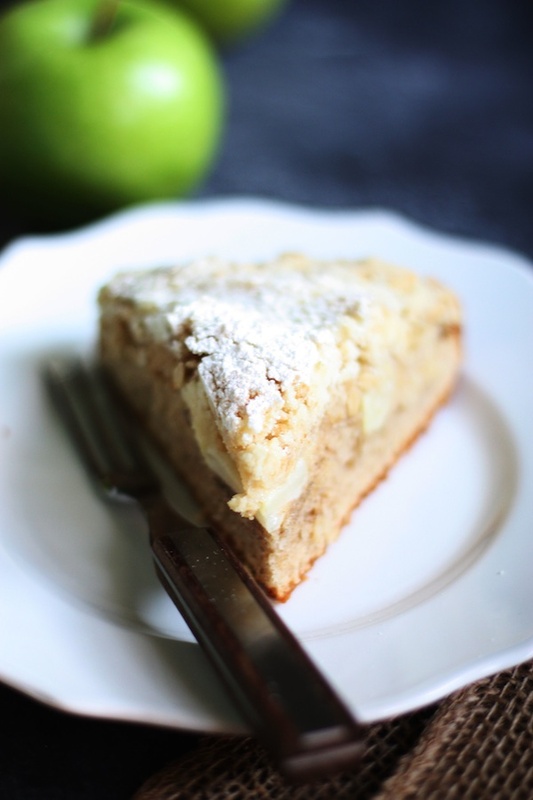 I kept things simple and seasonal with this beautiful and delicious Irish Apple Cake. Every step, from peeling and slicing the apples, creaming the butter and sugar, and crumbling the topping made me feel a little more like myself. The house smelled like warm cinnamon and apples, which was perfect on one of the first truly fall-like days we have had so far. Crisp, cool October air wafted through my kitchen window and I think I breathed a little deeper than usual in an effort to savor every wonderful smell. Aside from needing the simple therapy baking provides, I also felt it was appropriate to bake a cake during my first week of the third trimester. Baby is moving and grooving, kicking my ribcage whenever possible, and making it difficult to get a full night's sleep. This little boy is so active already that I'm beginning to think the whole second-child-is-easy-going rumor is a total lie. I guess we'll see what happens when he arrives! Until then, I'm going to keep drinking lots of chamomile tea, following every meal with a couple of Tums and taking advantage of random energy boosts to do very important things. Like baking cake. 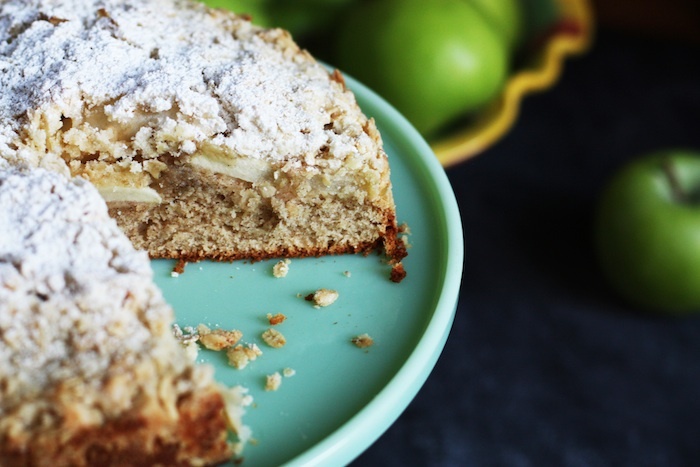 As I was researching recipes for Irish Apple Cake, I realized that they are all slightly different. Some have crumble topping while others do not. Some call for brown sugar while other use white. It seems that apple cake is different from home to home. I based my recipe on this one from The View from Great Island. I may or may not have had this for breakfast this morning. I blame the baby. Butter and flour a 9 inch spring-form pan. Cream together the butter and sugars until light and fluffy, about 2-3 minutes. Add the eggs, one at a time, and beat until fully incorporated. In a separate bowl, combine the flour, baking powder, cinnamon, nutmeg and salt. Fold the dry ingredients into the bowl with the butter and sugar. Add the buttermilk and stir until just combined. Pour the batter into prepared spring-form pan and spread into an even layer. Make the streussel topping by combining the flour, rolled oats, butter and sugar in a small bowl. Use your finger tips to work the butter into the dry ingredients until you have a crumbly mixture. Layer the apples over the cake batter and sprinkle with the streussel topping. Bake 50-60 minutes or until the top is golden brown and a toothpick inserted into the center of the cake comes out clean.